As Edinmore strive to keep one step ahead of our competitors, we are delighted to announce that we have recently been accredited with the Environmental Standard, BS EN ISO 14001 : 2004. This nationally recognised standard confirms Edinmore’s commitment to the environment and is seen as a reward for our ongoing focus on our Environmental Management System. 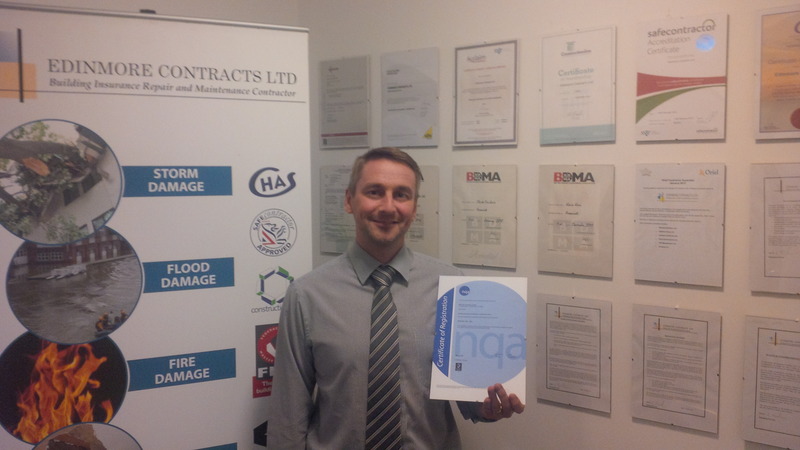 Our Health & Safety Manager, Steven Soroka, has been instrumental in implementing a viable Environmental Management System within the business which all office staff and tradesmen can relate to and contribute to. Pictured with the new accreditation certificate, Steven commented; “Edinmore are firmly focused on being a market leader in the Building Insurance sector and whilst there was no immediate requirement from any of our clients to obtain this standard, I felt that it would stand us in good stead if we were one of the first Contractors to achieve it. Obtaining ISO 14001 can be a lengthy process from start to finish and I’m sure that this recent accreditation, along with all our others, will help to consolidate our position in the insurance sector whilst also opening many doors in other sectors. There is far more focus on environmental issues now than there was 10 years ago and I felt it was important that Edinmore Contracts stayed one step ahead. There are obvious cost savings to the business by reducing our environmental footprint, reducing our CO2 emissions and focusing on our recycling ”.